The University College Dublin Choral Scholars make their debut Signum recording in a heart-on-sleeve programme of works, traditional and new, from Ireland and Scotland. Written by the eighteenth-century poet Seán Clárach Mac Dómhnaill, Mo Ghille Mear is a traditional allegorical song—similar to the Gaelic poetic form of the Aisling—in which the poet laments the departure of Prince Charles Edward Stuart (Bonnie Prince Charlie). As is customary, the poetic text portrays the land in decline in his absence. The drum used in this recording is the Irish single-headed frame drum, the bodhrán. Sun and Moon and Stars by poet Frank McGuinness and composer Bill Whelan was first performed at the University College Dublin (UCD) Foundation Day celebration in November 2013 and is a piece dedicated to Dr Hugh Brady, former President of UCD. Scored for solo soprano, solo violoncello and chamber chorus, it evokes the wonder and possibility of life through the musical painting of the text. Whispering choral writing supports a dialogue between soprano and violoncello, with the reflective nature of water suggested in the homophonic conclusion of each verse. The harmonic palette of jazz informs the choral music of Swiss composer, Ivo Antognini. A composer of music for television and film and an artist on three jazz albums, Antognini has directed his creative talents into the composition of choral music since 2006. His music has been performed around the world in more than forty countries by a long list of respected choirs. This disc contains the world-premiere recordings of two works, settings of poetry by Francis Ledwidge and Eva Gore-Booth, especially composed by Antognini for UCD Choral Scholars and David Agnew (obbligato oboe) in 2014. Michael McGlynn, a graduate of UCD School of Music, has had an extraordinary influence on Irish choral music, setting the three ancient types of Celtic music—Suantraí (lullaby), Geantraí (joyful song) and Goltraí (lament)—for his vocal ensemble Anúna (previously An Uaithne). Two of his works appear on this disc: Geantraí, a jaunty piece, and the macaronic (dual language) song Siúil a Rún, sung from the perspective of a woman longing for her absent soldier-lover. The 1904 collection of folksongs entitled Songs of Uladh is a collaborative gathering of ballads from the north of Ireland by the Belfast-born poet, Seosamh Mac Cathmhaoil (1879-1944) and Belfast-born musician Herbert Hughes (1882-1937). Mac Cathmhaoil and Hughes’s is the source, often overlooked, of many universally-admired songs such as My Lagan Love and The Gartan Mother’s Lullaby. According to the harper Mary O’Mara in her book A Song for Ireland, Gartan is ‘famous as the birthplace of Columcille (c521 AD) who gave the city of Derry its name and who is better known as the founder of a Christian outpost on the Island of Iona off the west coast of Scotland’. Collected by Mac Cathmhaoil from a Donegal woman called Cáit Ní Dubhthaigh, The Gartan Mother’s Lullaby exhibits characters and images from Gaelic mythology throughout the narrative of this gentle song. Aoibheall from the Grey Rock—also known as ‘Aoibhinn the Beautiful’—is Queen of the northern fairies, the Aos Sí, a supernatural race said to live underground in Irish and Scottish mythology. Siabhra, mentioned in the second verse of the song, is the generic word for a fairy of any kind, but refers here to the atmospheric ghost creature that frequents bogs and marshes. The Coast of Galicia is another gentle piece for solo harp from Bill Whelan’s first major orchestral work, The Seville Suite. The movement follows the journey of Aodh Ruadh Ó Dónaill (‘Red’ Hugh O’Donnell) from Ireland to La Coruña in Spain following the defeat of Gaelic Ireland at the Battle of Kinsale in 1602. The subsequent exodus of Gaelic aristocracy to continental Europe, known as the ‘Flight of the Earls’, left their territories open to the organised colonisation by Scottish and English settlers, an event which reverberates in Ireland to this day. The Seville Suite stands as a reflection on these historical events. Published in his 1899 collection The Wind Among the Reeds, Aedh wishes for the cloths of heaven (commonly known as He wishes for the cloths of heaven) is one of Yeats’ most cherished poems. The perceptions and experiences of the poem’s speaker unfold through colourful language, evoking a realm suffused with magical light. It is thought that the sentiments expressed reflect the poet’s personal fear of Maud Gonne’s resistance to his advances, his dread at her refusal of him as a lover, and the forsaken state of abnegation that would inevitably follow such a refusal. Scored for mezzo-soprano solo, harp and choir, this delicate setting of the poem highlights Yeats’ evocative words: ‘Tread softly because you tread on my dreams’. Orphan Girl was written by Brendan Graham for a ceremony held in 2012 at Sydney’s Hyde Park Barracks to commemorate the relocation of over four thousand female orphans who were brought from Ireland during the Great Famine of the 1840s. An Orphan & Pauper Scheme was devised by Henry George Grey during his time as Secretary of State for War and the Colonies (1846-1852) and was designed to resettle destitute girls from the failing network of workhouses to a land in much need of females. It is sung from the perspective of one of these girls on the night before her inspection, which would decide whether she could travel to this far-away land, Australia. Graham wrote the song to ‘help fade the girls into history’. The names of some of the girls are etched into a glass wall memorial now standing in Sydney’s Hyde Park. Orphan Girl was first performed by the Australian Girls’ Choir and Sarah Calderwood at the 2012 ceremony. Michael Rooney is widely regarded both as a prolific composer and as an accomplished performer in the Irish traditional-music style of harp performance. As Director of the National Folk Orchestra of Ireland, he is regarded as one of the world’s finest exponents of the Irish harp. Land’s End is a slip jig named after a place in Montauk, on the east coast of the United States of America, where Rooney and his wife visited in 2004. Two American melodies from Kentucky are widely associated with the lyric Black is the colour of my true love’s hair. The younger melody was composed by Kentuckian John Jacob Niles, collector and performer of Appalachian folk songs, and an important influence on the American Folk revival in the 1950s. In a biography of Niles—I Wonder As I Wander—Professor Ron Pen of the University of Kentucky has observed that Niles created a completely different melody from the versions he had collected in Kentucky in 1916. The melody used for the choral arrangement on this disc is the version sung by Irish singer/songwriter Christy Moore, who learned the song from Scottish folk singer Hamish Imlach in 1968. This modern Scottish song is a rendering of an Appalachian antecedent of Niles’ version collected by Cecil Sharp in Kentucky and published in English Folk Songs from the Southern Appalachians (1917). The lyrics of Sleepsong came to Brendan Graham on the night before his youngest daughter Alana was to leave Ireland for Australia in 2004: ‘Sitting at her bedside, as I did so often when she was a child, the years seemed to roll away and I was back there in the past, telling her stories and singing lullabies. As I walked back down the corridor to my study the song unfolded itself to me.’ Sleepsong is a lullaby for an older child that mingles a father’s hopeful wishes with the longing brought about by the departure of a loved one. Written to a melody by Rolf Løvland, Sleepsong was first recorded for the Secret Garden album Earthsongs (2005). First published in London as part of a collection entitled Songs of the North (1884), The Skye Boat Song recounts the escape of Bonnie Prince Charlie from Uist to the Isle of Skye following his defeat at the Battle of Culloden in 1746. With lyrics written by Sir Harold Boulton to a tune entitled Cuachag nan Craobh, this song is typically sung as a lullaby. Versions of the song by The Corries, Sir James Galway and The Chieftains, Julian Lloyd Webber and other artists, have reinforced its status as one of the best-known songs of Scotland. The television composer Bear McCreary adapted the tune to the text of Robert Louis Stevenson’s poem Sing me a Song of a Lad that is Gone for the TV series Outlander. More recently, a version of this arrangement was commissioned by Nigel Short for his London-based ensemble, Tenebrae. The Parting glass has its origins in the early seventeenth-century Scottish song ‘Good Night and God be With You’ which used a tune different from the contemporary setting. A version published by Henry Playford (Henry Purcell’s publisher) in the ‘Collection of Original Scotch Tunes’ displays similarities to the contemporary melody. It was often played at the close of gatherings in Scotland. At the end of the eighteenth century, Robert Burns used the older tune to set his poem ‘Adieu! a heart-warm, fond adieu’, and in 1821 Sir Walter Scott published a variant of the song entitled ‘Armstrong’s Goodnight’. A text from an early nineteenth-century Glasgow source, now at the National Library of Scotland, closely resembles the modern song. Between 1840 and 1860 a variant of the song was published in Ireland as ‘The Parting glass’. The modern tune first appears as ‘Sweet Cootehill Town’ in an early twentieth-century collection of Irish songs entitled ‘Old Irish Folk Music and Songs’. It was this Irish melody that nudged aside the original Scottish tune to become one of the most popular ballads in recent history. There is something magical about the Atlantic coast of Ireland and Scotland—the breathtaking light in winter, the exhilarating smell of the sea, and the ceaseless sound of the waves smashing against headland and cliff. Look out to sea and the mysterious horizon beckons you to new futures; turn your gaze inland and ten thousand years of history unroll before you. Sligo, sheltering itself between the promontories of Mayo and Donegal from the wild energies of the Atlantic, is the spiritual homeland of William Butler Yeats and the birthplace of Eva Gore-Booth. In the current commemorative decade of centenaries that honour sacrifice, celebrate service, mark upheaval and transformation and, above all, remember war and peace, I thought it fitting that we should make our contribution by recording settings of Gore-Booth’s poem ‘Peace’, and Francis Ledwidge’s ‘War’, by the Swiss composer, Ivo Antognini. Other pieces included on this disc are taken from the Choral Scholars’ recent tour of the eastern coast of the United States of America and from a programme performed at the Temple Bar TradFest in Dublin. Much of this selection straddles the worlds of traditional music—pieces such as Geantraí, The Parting glass, and ‘Sí do Mhamó í—and the more orthodox classical choral repertoire. Other works included here, specially composed for the Choral Scholars—Sun and Moon and Stars, Peace, He wishes for the cloths of heaven and War—are perhaps best classified as High Art. 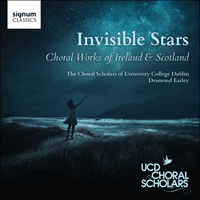 It is happy coincidence that the title of this disc, Invisible Stars, and the motto of University College Dublin—Ad Astra (‘to the stars’)—connect in this, our first recording with Signum Records. This recording is our celebration of creativity, talent and youthful energy and at the same time a gesture of remembrance towards the many ‘invisible stars’ who went before us a century ago.